*Click Here for “Notes Up Front” and the “Legend” for various topics covered below in the “Live Updated” THW’s NHL 2012 Entry Draft Guide – The Next Ones home page. … if he were a Swiss National. He recently played for the French national team, and his father is French. Thus his flag is the Tricolore and his blood is French, but his hockey–Swiss. In 2010-2011 Bozon played with Switzerland’s HC Lugano, where he was averaging just over a point per game. 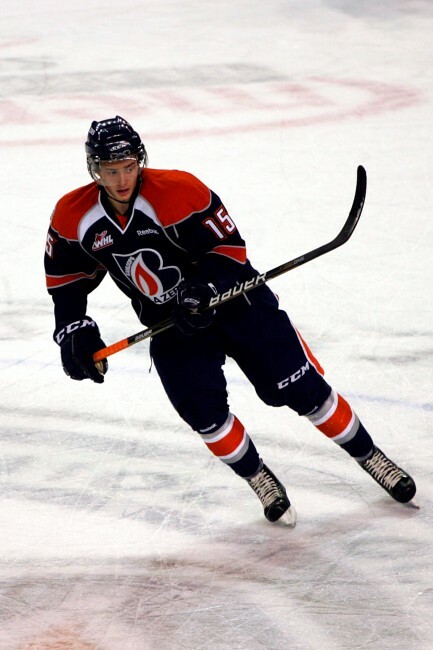 The Kamloops Blazers selected him in the 1st round, 27th overall, in the 2011 CHL Import Draft, allowing him to realize his dream of competing against the best Junior hockey players in the world. Few expected him to maintain his point-per-game average as a WHL rookie, but he did just that, scoring a fabulous 36-35-71 in 71 games for a powerful Blazers squad this past season. Among WHL rookies, his 36 goals were good for first and his 71 points, for second; together they earned him the Western Conference nomination for Rookie of the Year. In just his second WHL game, Bozon notched three assists; it would be the first of 18 multi-point games for him on the season, highlighted by a four point night against Swift Current (2g, 2a). During an impressive 17 game stretch, Bozon racked up 25 points (11g, 14a) in point streaks of nine games and seven games respectively. Had he earned a single point against the Tri-City Americans on 21 January 2012, a 17-game point streak would have tied him with Medicine Hat’s Emerson Etem for fifth longest in the WHL. Tim, along with linemates Colin Smith and JC Lipon, helped Kamloops to an impressive 47-win season, and in their first round sweep of the Victoria Royals Bozon picked up four goals. He managed just one goal in the second round against the Portland Winterhawks, a series they lost in seven games but only after coming back from being down 3 games to 0, then in game 4 coming back from a 4-0 deficit, and then winning game 6, one of the greatest games in Kamloops history, an astonishing third period comeback that must be heard to be believed (listen to Jon Keen’s spectacular radio call of Kamloops’ third period goals and try to convince yourself that there are a mere 5,000 people in attendance). It seems most hockey watchers underestimated Bozon’s ability to adapt to the North American game. He has credited his coaches, teammates and billets for his smooth transition. In a Hockey’s Future podcast from the CHL Top Prospects game in February, the multi-lingual winger said that players coming from Switzerland in general have an easier time adapting to the change in size and speed than their European counterparts because in many cases they have been playing among pro hockey players since they were 16. NHL Central Scouting’s final rankings has Bozon at #42 among North American skaters. On their 17 April top 50 ranking, ISS has Bozon at #39. “Along with his skating, his offensive abilities are his strongest attributes. He’s got great hands, is an excellent handler of the puck and is both a strong passer and shooter. He spends quite a bit of time hovering around the offensive zone and around the goal, even if he isn’t overly physical.” — Cody Nickolet, WHL From Above. “… the lanky forward has shown a solid offensive skillset, showcasing a quick release and slick passing skills to go along with quick footwork and a strong work ethic. Bozon will need to continue to work on his defensive zone play, and will need to exert a more consistent nightly effort, and will also need to bulk up his frame. “ — The Scouting Report: Midterm Rankings. Gifted offensively, the kind of skills you can’t teach. Gifted agitator, and he can do it in four languages. To play a power forward’s game, he’ll need some bulk. But the NHL comparisons cited below don’t point in that direction. Born in North America– an offensive dynamo with the Kamloops Blazers– played for a European National team and for Switzerland’s HC Lugano– anyone else think Hnat Domenichelli is trying to play out Tim Bozon’s career in reverse?